H.T.Fib are hoping to arrange some gigs and will continue to apply to play at festivals. 2008 saw the completion of the first proper album, "Something Else", which was finished musically just before xmas 2007 but it took a while to finish off the artwork. H.T.Fib last appeared publicly at the March festival, where they played a 40 minute set supporting the main band on the Sunday of the festival. It all started when Marck (current leader, main songwriter) and Ade, friends from local am-dram, joined Maurice Taylor (bass), Jerry Riches (keyboards) and Mark Westlake (writer, co-writer and co-leader) jamming out at Maurice's shed. Marck and Mark met in first in 1996. They co-wrote the first new song, "Ever a time", in January 1997 and suggested that Maurice and Ade might like to form a band with them to play the original material. Dusting off some of the old numbers from years gone by and dashing off new songs at a pretty reasonable rate, the band began rehearsing. Jerry was asked to join in some time in February and by April, the set was shaping up, a name had been found and the first of the H.T.Fib Catalogue "Rehearsal Takes" tapes came into being. The set grew to 15 well polished original numbers in varying styles covering reggae, jazz, rock, soul, folk, pop, salsa and funk. The Fibbers began trying out the numbers at local Jam nights at Barrington and The Eagle Tavern culminating in the first full showing of all 5 of us playing 3 songs from the set at the Eagle on the 11th July 1997 to great appreciation. We were featured on Orchard FM, the Taunton based local radio station, with James Richards on Sunday 3rd August 1997. We talked about the music, did a couple of live numbers on-air and James played "Long Rider" off our sampler CD. Having finished a mini tour of the area in early 1998 things quitened down while Jerry disappeared in a flurry of reproductive activity and Maurice left to pursue his dream of being a guitarist (which he already was, really). Easter 1999 and Gilly Betsworth (the band's early manager) introduced Marck to Ali Groves, a young singer-songwriter with a great voice, a great attitude and some real talent. Julian Dorse diverted some time from playing with his own band, "Chard Remains", to spend it with us, working on some new material and playing some gigs. In the autumn of 1999, Ali went off to University in Chester to study drama and the band went on standby for her return. In March 2000, Marck and Mark spent an amazing weekend with Michael Marshall writing and recording. The result was the haunting "Falling down again" - a poignant and mesmerisingly produced piece of music that heralded a new direction and a new format for the band. In June of 2001, Marck's partner Emily requested a 25th birthday party command reunion HTFib gig. Ali couldn't make it and Jules had gone his own way. So we got Michael to come in for the occasion and bring his old friend Greg to stand in on bass. Stand in??? It was an instant chemistry and suddenly a grown-up HTFib line up was there. 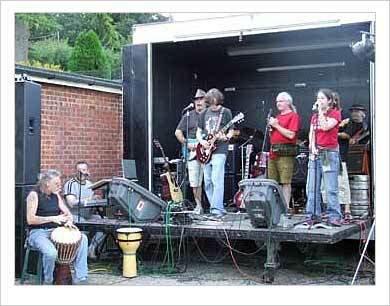 In the summer of 2004, the band celebrated Ali's return to the fold and played 2 local gigs. These gigs also saw the introduction of Bill Nabb to our line up. Bill had been a close friend of Michael and Greg for decades and a well established singer and songwriter in his own right.Guesting at the gigs was Karina Berry, who played some of her songs during the interval. Playing some unplugged songs at an open mike session at the Acoustic Cafe in Sidmouth landed the band a prime slot playing at Dukes for the 2005 Sidmouth Festival. In the summer of 2006 Bill succumbed to cancer and is no longer with us. He is missed by all who had the pleasure of knowing him and his music will be missed by the world. In February 2006, H.T.Fib spent a day at Beehive studios in Weston Zoyland. Just the one. We came home clutching a pile of CD's containing an album's worth of recorded drum tracks. A good day's work for Ade! While we were layering on the various parts and pieces for the first proper H.T.Fib album, Mark Westake left the band and to be replaced by Seb both on the recordings and at live gigs. Pat White has also joined the band to add his own inimitable touch on guitar.